Simple assumptions often give rise to surprising and delightful consequences. Think about games and puzzles like chess and Rubik's cube, where enormous complexity arises from simple rules. The same is true of cellular automata, juggling, fractals, and more! 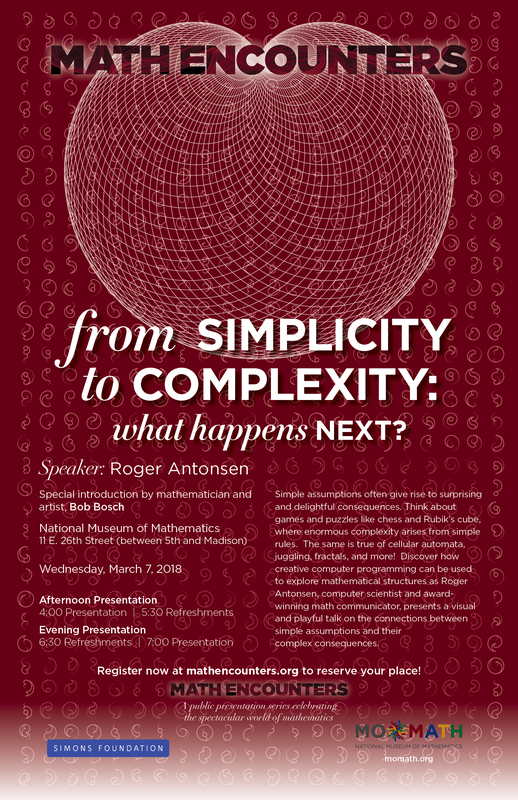 Discover how creative computer programming can be used to explore mathematical structures as Roger Antonsen, computer scientist and award-winning math communicator, presents a visual and playful talk on the connections between simple assumptions and their complex consequences. Special introduction by mathematician and artist, Bob Bosch. Light refreshments will be served after the 4:00 pm session and at 6:30 in advance of second session.